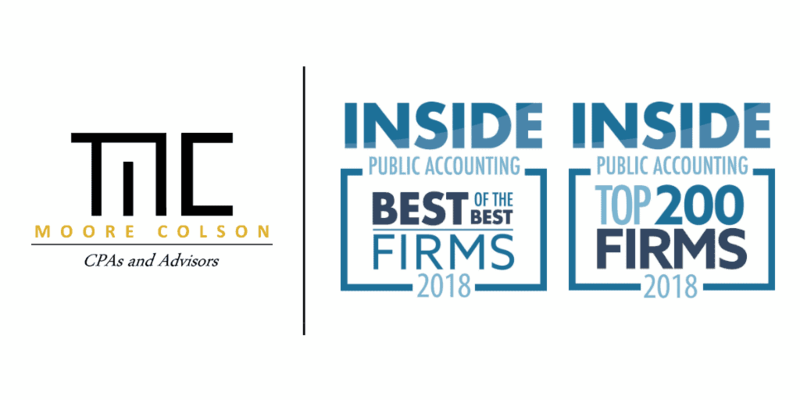 Moore Colson, a nationally-recognized, Atlanta-based CPA and advisory firm, has been ranked as a Best of the Best Accounting & Advisory Firm in the United States in 2018 by INSIDE Public Accounting (IPA). Moore Colson has ranked as a Best of the Best firm since 2013, and in 2017, it ranked number one on the Best of the Best list. It is also Moore Colson’s fifth consecutive honor as one of America’s Top 200 largest CPA and advisory firms. IPA has nearly 30 years of experience in independent reporting, surveying and benchmarking, and has ranked the highest performers in the accounting profession for more than 20 years. Each firm is rated on more than 70 unique metrics with an ever-evolving proprietary formula with a key focus on staffing, training, governance, organizational structure, and strategic focus. In 2018, 550 firms were eligible for this accolade and 50 firms were ranked on the Best of the Best list.